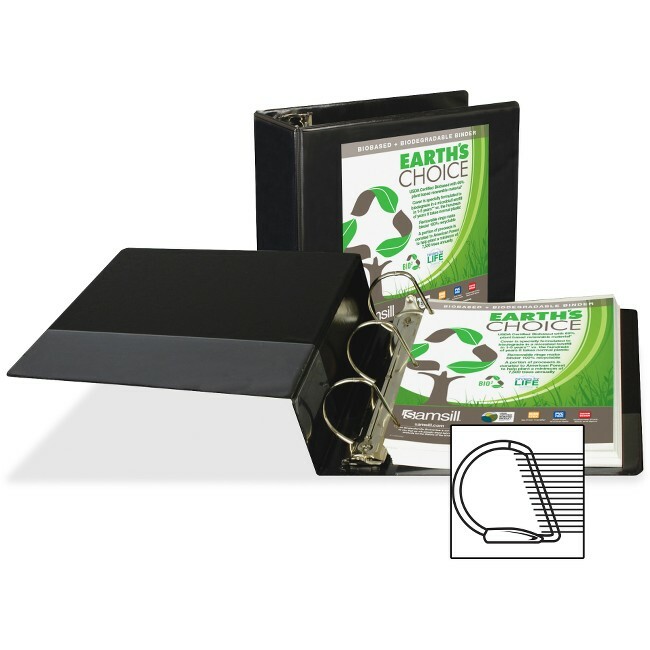 Eco-friendly view binder features removable rings that make the binder 100 percent recyclable. Chipboard is made from recycled material, and the acid-free, PVC-free polypropylene is environmentally safe. A portion of proceeds from each binder purchased is donated to American Forests to help plant a minimum of 7,500 trees annually. Clear overlay on the front, back and spine allows easy customization. Locking, D-rings open and close with one easy touch and tightly secure documents while holding 25 percent more letter-size sheets than standard round rings. Rings are mounted on the back cover to reduce wear and let pages lie flat. Rust-resistant metal rings offer double boosters for even open and closing. Two, clear inside pockets store additional loose papers. Special ribbed seal adds flexible strength at the hinge. Binder also features exposed rivets.